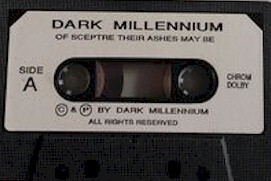 Dark Millennium was formed in 1989 by Theissen and Hesse. 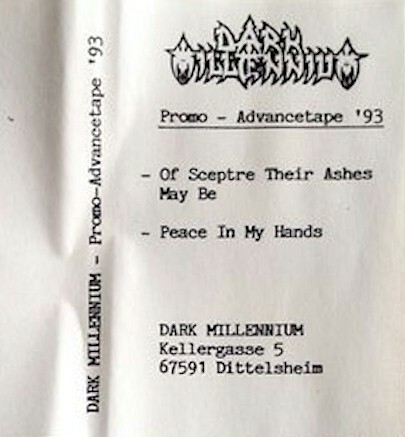 After the release of two demos ‘The Apocryphal Wisdom’ and ‘Of Sceptre Their Ashes May Be’ (featuring Torsten Gilsbach on vocals instead of Christian Mertens) they released their debut-LP ‘Ashore the Celestial Burden’ on Massacre records in 1992. It was well-received. The follow-up ‘Diana Read Peace’ with ex-Despair bassplayer Pachura was released in 1993. Dark Millennium then proceeded to disband. Xeroxed one panel cover. Studio tapes.